Going nowhere all summer long can have some perks. If you have a garden, you don’t miss out on all the bounty appearing each day. If you don’t have your own garden, you can forage for berries or pick them at a farm. And perhaps you might win the garden lottery, and be asked to tend a friend’s garden while they are away, which is what is happening to us this week. I was thrilled to have enough garden fresh produce to make pesto sauce again. The basil picked from the garden smelled heavenly and was still the main flavour of the sauce, even though I added spinach for more volume. Armed with a rubber spatula and a helping of patience, even my pedestrian blender was coaxed into making a fine, smooth pesto sauce that offered may possibilities. I finally settled on using it in pasta salad for lunch, which was one of many right choices I could have made. We enjoyed the pasta salad even more by eating it al fresco, on our shaded deck. Should you have any pesto sauce leftover, why not make some pesto olive bread twists? I’d also love to make a double batch of pesto and then freeze a portion. Freezing pesto makes it possible to indulge later in the season, when the growing season is winding down for fall. Then all that is needed is to thaw, stir, and enjoy. Combine all the desired ingredients in a blender or food processor. Process until smooth, adding small amounts of water and scraping the sides of the container as needed. 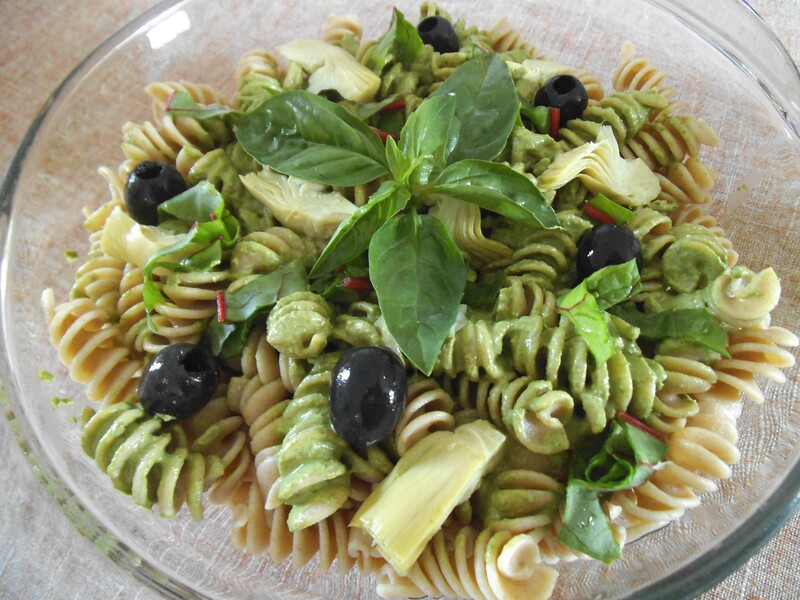 In a large bowl, toss pasta with pesto sauce until pasta is evenly coated. Add olives and artichoke hearts. Toss to incorporate. For the optional ingredients, you can serve the basic pasta salad and place the other ingredients in small dishes for people to add according to their preferences. Or you may toss the additional ingredients into the salad before serving. I’m sharing this at Pennywise Platter, Inspiration Spotlight, and Foodie Friday. 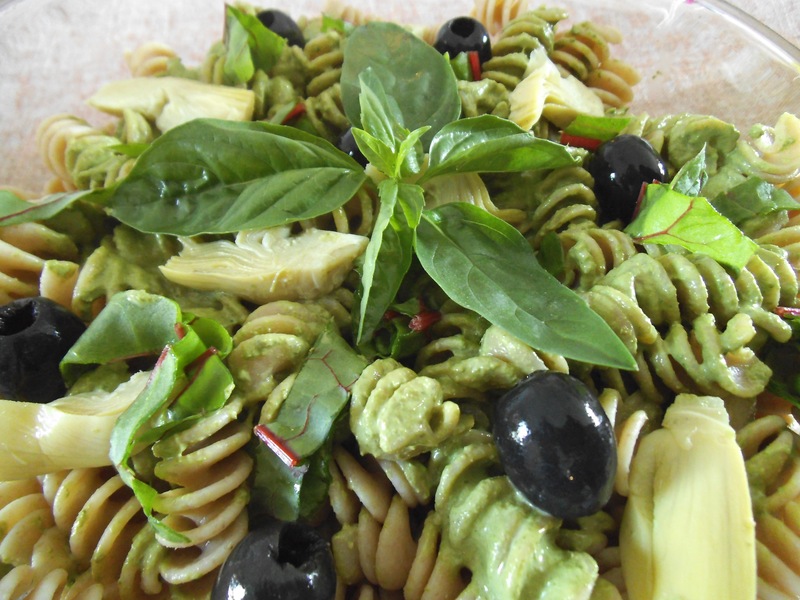 The combination of the greens and pasta are refreshing and beautiful! Thanks! It’s a perfect summer salad for those reasons.